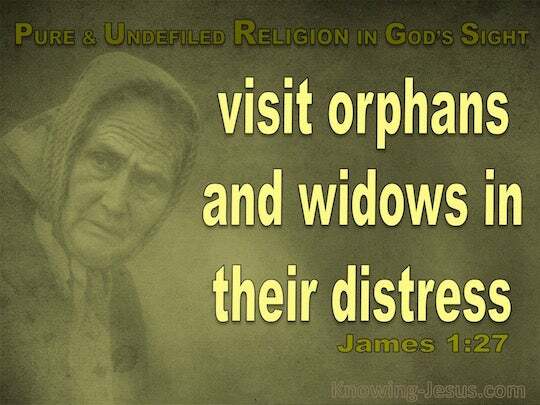 ﻿ James 1:27 Pure and undefiled religion in the sight of our God and Father is this: to visit orphans and widows in their distress, and to keep oneself unstained by the world. Pure religion and undefiled from God and the Father is this, to go help the orphaned and the widows in their affliction, and to keep himself unspotted from the world. Religion, pure and undefiled before God and the Father, is this: To visit the fatherless and widows in their affliction, and to keep himself unspotted from the world. Religion that is pure and undefiled in the sight of our God and Father is this: to visit orphans and widows in their distress, and to keep oneself unstained by the world. pure and unadulterated religion, in the eye of God our father, consists in taking care of orphans and widows in their distress: and in keeping clear of the vices of the age. Pure and undefiled religion before God and the Father is this: to visit orphans and widows in their affliction, to keep oneself unspotted from the world. Pure religion and undefiled with God even the Father is this, to relieve the orphans and widows in their affliction, and keep himself unspotted from the world. A religious observance that is pure and stainless in the sight of God the Father is this: to look after orphans and widows in their trouble, and keep one's self unstained by the world. Pure religion and undefiled before God and the Father is this, To visit the fatherless and widows in their affliction, and to keep himself unspoted from the world. The pure and undefiled religion before God and the Father is this, To visit the fatherless and widows in their tribulation and to keep thyself unspotted from this world. Religion pure and unpolluted before God and the Father is this, To take a view of the orphans and widows in their pressure, to keep himself free from stain from the world. Pure and undefiled religion in the sight of our God and Father is this: to look after orphans and widows in their affliction, [and] to keep oneself unstained by the world. Pure religion and undefiled before God and the Father is this, to visit orphans and widows in their afflictions, and to keep oneself unspotted from the world. Pure devotion, and undefiled before God the father, is this: To visit the friendless, and widows in their adversity, and to keep himself unspotted of the world. Pure, unsoiled religion in the judgment of God the Father means this: to care for orphans and widows in their trouble, and to keep oneself from the stain of the world. and undefiled before our God and Father, to look after orphans and widows in their affliction, and ever to keep himself unspotted from the world. 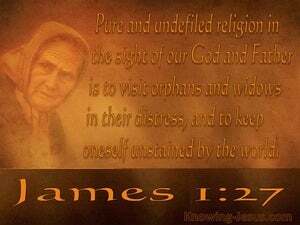 Pure religion and undefiled before God, the Father, is this, to visit the fatherless and widows in their affliction, and to keep ones self unspotted from the world. Pure religion and undefiled with the God and Father is this, to visit the orphans and widows in their affliction, and to keep one's self unspotted from the world. 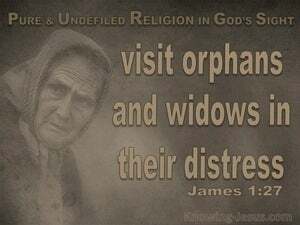 Religious observance, pure and undefiled with our God and Father, is, this - to be visiting orphans and widows in their affliction, unspotted, to keep, himself, from the world. Pure religion and undefiled with God even the Father is this, To pay diligent attention to the orphans and widows in their affliction, and to preserve himself spotless from the world. That religious observance which is pure and spotless in the eyes of God our Father is this--to visit orphans and widows in their trouble, and to keep oneself uncontaminated by the world. The religious service which is pure and stainless in the sight of our God and Father is to visit fatherless children and widowed women in their time of trouble, and to keep one's own self unspotted from the world. A religious worship that is pure and stainless in the sight of God the Father is this: To look after orphans and widows in their trouble, and to keep one's own self unstained by the world. 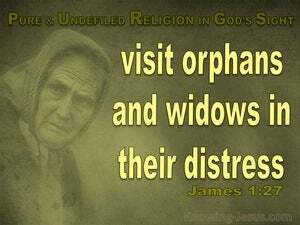 A religion, pure and undefiled with our God and Father, is this: to visit orphans and widows in their tribulation, and to keep himself unspotted from the world. Pure and uncorrupt religion before God and our Father is this, to take care of orphans and widows in their affliction, and to keep himself unspotted from the world. religion pure and undefiled with the God and Father is this, to look after orphans and widows in their tribulation -- unspotted to keep himself from the world.